SportsLine's advanced computer model simulated Omaha vs. North Dakota State 10,000 times. The Summit League title and an automatic berth to the 2019 NCAA Tournament are on the line Tuesday when the North Dakota State Bison and Omaha Mavericks meet at 9 p.m. ET. The Mavericks are three-point favorites, with the over-under set at 144.5 in the latest Omaha vs. North Dakota State odds. The Mavericks are seeking their first March Madness bid since the program started in 2012, while North Dakota State is seeking its first appearance since back-to-back appearances in 2014 and 2015. But before you make your 2019 Summit League Championship game predictions, be sure to check out the Omaha vs. North Dakota State picks from the proven computer model at SportsLine. Now, it has set its sights on Omaha vs. North Dakota State. We can tell you the model is leaning over, and it also says one side cashes in well over 50 percent of simulations. You can only see that one at SportsLine. The model is well aware that No. 2-seeded Omaha is one of the best shooting teams in the nation. The Mavericks are 13th with a three-point shooting percentage of 39.1. In conference play, they've been even better, hitting 40.8 percent of their treys. That's the best mark in the conference and it's rooted in an ability to stretch the floor with four of the five players in their starting lineup. In fact, Zach Jackson, Mitchell Hahn, J.T. Gibson and K.J. Robinson all shoot at least 38.4 percent from beyond the arc. But just because the Mavericks are a strong three-point shooting team doesn't mean they'll cover the Omaha vs. North Dakota State spread on Tuesday. North Dakota State had the league's best defense in conference play, allowing just 73.1 points per game. And the Bison have been red-hot from beyond the arc themselves, which could flip the script from their 58-50 loss to Omaha late last month. The Bison shot just 27.3 percent from beyond the arc in that game, but have hit 52.2 percent of their three-point attempts so far in the conference tournament. Who wins Omaha vs. North Dakota State? And which side of the spread hits well over 50 percent of the time? 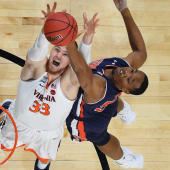 Visit SportsLine now to find out which side of the spread you should be all over, all from the model that's up over $4,000 on top-rated college basketball picks the past two seasons, and find out.